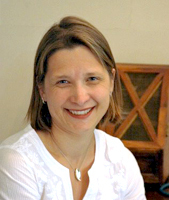 Dr Ania Hargrove graduated from the University of Melbourne Medical School in 1996. She became a specialist consultant paediatrician in 2004 after obtaining her Fellowship of the Royal Austalasian College of Physicians. Dr Ania has worked for many years at the Royal Children's Hospital, Melbourne. Over the years, she has also been extensively involved in teaching and examining medical students in the field of Paediatrics at the Department of Paediatrics, the University of Melbourne. Dr Ania enjoys seeing all general paediatric problems in her practice and has special interest in Paediatric Allergy for which she also consults at Epworth Allergy Specialists in Richmond. After one of her children had eczema, food allergies and hay fever, Dr Ania experienced first hand the uncertainties and the practicalities surrounding the diagnosis and possible treatment options. She offers a personal perspective on whether to skin prick or not, whether to have an Epipen or not, which creams and ointments to use for eczema, how and when. Dr. Ania has now extended her allergy practice to Bulleen and is able to offer on-site skin prick testing. Evaluation of food reactions and food allergies in babies and children, anaphylaxis, eczema treatment, hay fever diagnosis and treatment options are available.